Grealish Greetings » Blog Archive » ASSEMBLE THE MINIONS! No, literally… assemble the minions. 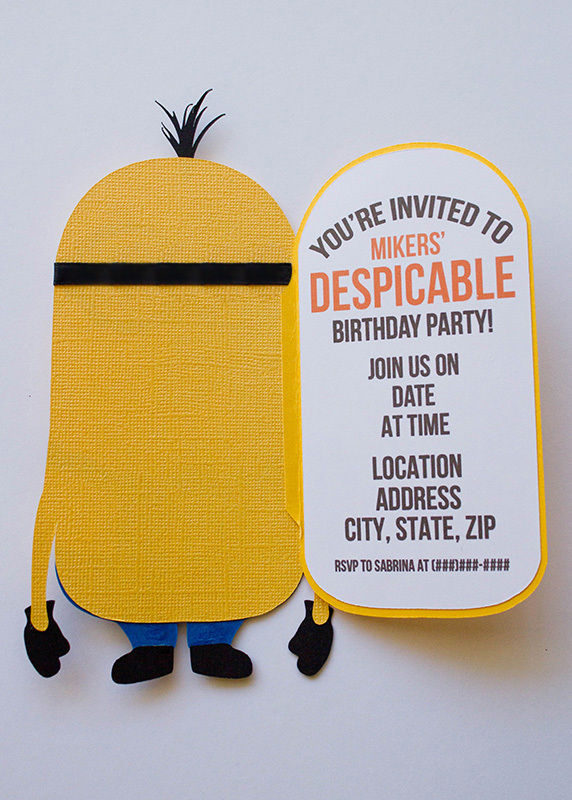 Just download the free .svg file below to make your minion invite for your own little minions! Make them with one eye or two eyes, or mix it up and make both! Help me keep this site going! They are so cute I could die! I hope you all enjoy them! Thank You so much I am going to make this for my sister.. THANK U THANK YOU!! I’ve even gotten my husband hooked on the minions and he’s not crazy about cartoons. Thanks so much for the card, I plan to use it for a Happy Despicable Birthday card. Oh I love this! Thanks so much. I am going to make a bulletin board for my 4th graders. These are AmAZING!! Thank you so much for posting and sharing; my son is OBSESSED with Despicable me right now! thank you for sharing this adorable file! 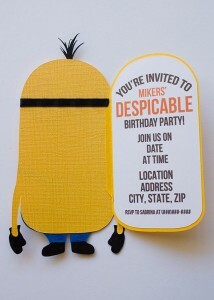 My son is invited to a despicable party and I think this is just right!! thanks again!!! Thank you so much, my little princess love this guys!!! I’ve been trying for 3 hours to get this to work. Because it’s a zip file, I can’t do a thing with it. Can anyone help? Hi, Megan. You are actually not the only one who has been having trouble with this file lately. I have tried updating it numerous times on this site and it always ends up not working. Would you like me to try to send the file to your email? I see Megan is having trouble with the .zip file. Did you extract the zip file before trying to use it? Thank you, Keisha, for the suggestion! For everyone that was having difficulty with the minion .svg, I recently updated it so please give it another try 🙂 Sorry for the inconvenience before! Thank you for this, I love it. But how do I get it to work with my Cricut Expressions? Hi, Cindy! Thank you and you are welcome! The .svg file can be used with the Circut only if you have the compatible software, which is Sure Cuts A Lot 2. However, it is only compatible with the Expression, not the Expression 2. Hope this helps! Hi Sandra. The .svg can be used in the software (Sure Cuts A Lot 2) that is compatible with the cricut machine but you can’t actually save it to the machine itself. Hi ladies i just got the silhouette cameo and i am fairly new to this i want to cut this out with my machine but am having trouble with loading the file to the design studio i have already extracted the file and idk what a i doing wrong ? was sooooooo bummed to see it will not work with my Cricut expression 2. I can’t find anything that will work! Thank you so much for having this free svg file! we are having a minion birthday party for our 3 y.o. son in October and this was such a huge help! I just got the new Cricut Explore and its so sweet, this printed out all the pieces I need easily. I DO have a couple questions…how did you print the invite info on the white portion of paper, as its funny shaped and I dont know that it will fit in my printer? and did you use black ribbon as opposed to a strip of paper for the goggles strap? thank you! Thank you so much for this free cutting file. 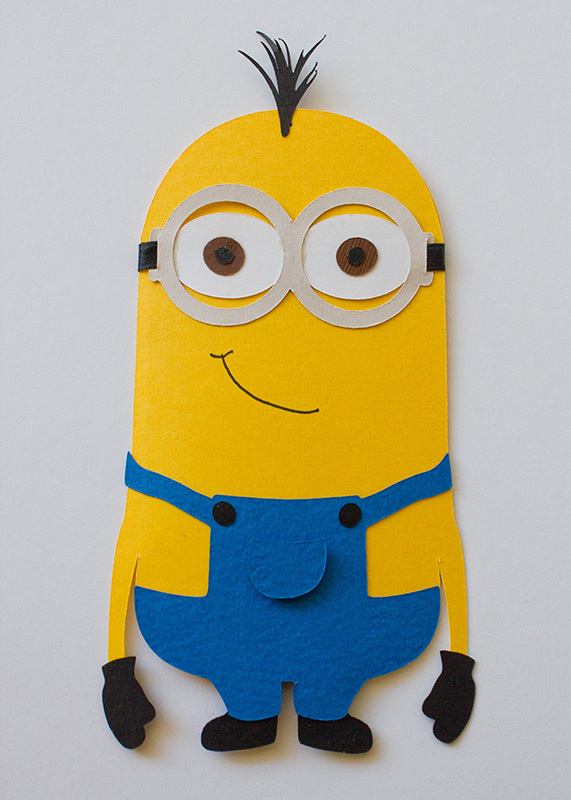 I was just going to make a card with a picture of the minions on it for my grandson’s birthday but this is so much cuter. This is adorable! Thank you so much for sharing!! THANKS for an awesome idea!!! Grandson LOVES it. Thank you for this adorable file. Thank you SO MUCH! I have the silhouette cameo and I created him as a print and cut with the glasses and pocket as extra cut pieces. Your SVG made it so simple easy. Bless you! My granddaughter is super excited. Thank you for the support! I took a look at your site… very cute!!! I love this invitation and was hoping to get the template and cut it by hand..do you think there is a way i can get the template as a print out? Hiiii….First of all, what an ADORABLE file!!! I am extremely unfamiliar with Safari so I am not sure if I can help. Have you tried finding a cricut explorer forum and asking? There my be someone on there that can help you. I am so sorry! I have silhouette studio and I can’t get it to load. I just got mine 4 days ago so I know practically nothing about it yet. Could you please help me?? I am so excited I found this!! I tried the link you posted above but i don’t have the svg thing on mine? It tells me that it’s not supported? Hi Emma. I can try to help. The file I have uploaded is actually a .zip file that contains a .svg file, so you have to extract it before you can import it into silhouette studio. Did you try that yet? What font did you use inside the invitation? I hope I will manage to cut it with my cameo…..
Hi! I fixed the problem a while ago (it was a silly mistake on my part) and had not had any complaints for a while, but now there is a different problem that I am currently looking into. I will let you know as soon as I have this fixed – hopefully sometime tomorrow! Hi there! I have tried downloading the file on various computers and it has worked everytime. Did you click on the picture or the link below the picture? Yay! Glad to hear that. Happiest of birthdays to your son! hi, I downloaded the file and opened on my silhouette, how do I go about cutting vinyl do I just cut different times for different colors? this is the first time trying something on the cameo? sorry! Thank you so much, I was going ot make one and thought Id have a look to see if anyone else had and came accross this. So pleased, saved me a tonne of time! This file is so cute, thank you for making it available. I didn’t use it as an invitation I used it just as a card front for my granddaughter, I was able to add her initial to the little pocket to be a bit more personalized. I did this on the cricut explore in design space and had no problems working with your file, I did find that I needed to attach the different cut lines like to the goggles, it comes in as two different mats, actually a lot of different mats but the cuts come in for seperate mats, not attached to the mat for the goggles, but I had just done something else where I got to learn how to do this so it was an easy adjustment, other than that little adjustment your file works great for the cricut explore just as it is. I really appreciate the work you put into this and for sharing it. Thank you.